When the latest generation (ND) Mazda MX-5 Miata was first released, I thought it was a fantastically fun and well designed car. 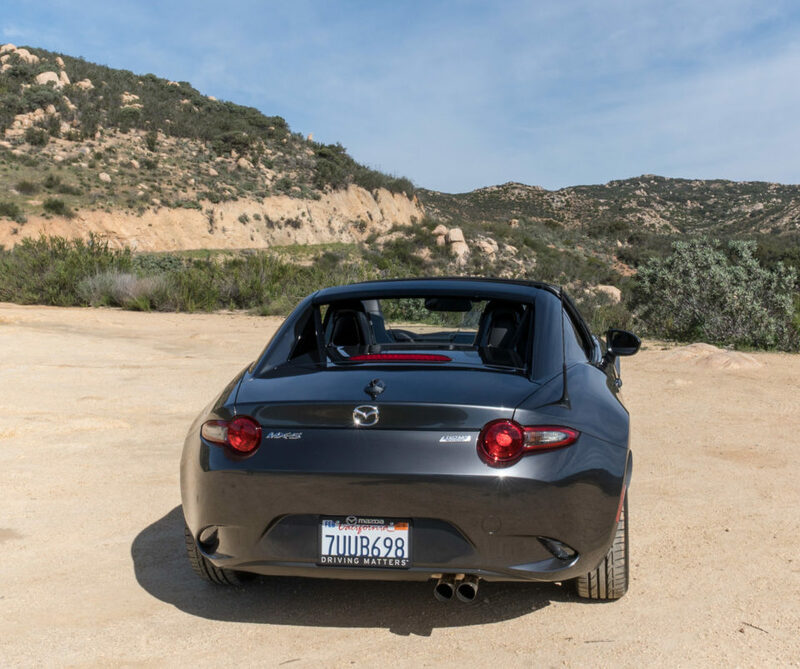 Going back to basics by providing a lightweight, balanced vehicle with a responsive engine and great transmission made it the best Miata since the highly-regarded first-generation model. 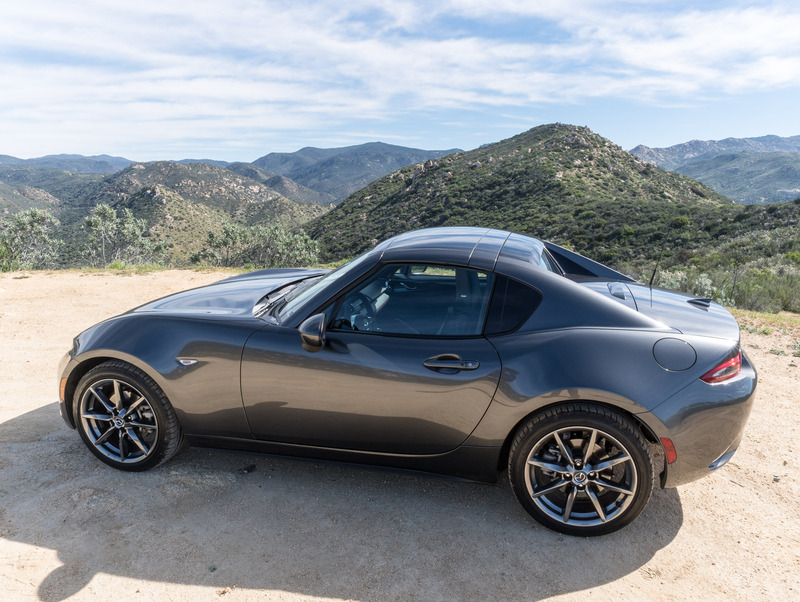 Now, we’ve got the icing on the cake with the release of the 2017 MX-5 RF, which drives every bit as well as the roadster, but looks even better, and offers greater year-round driving ability, and a quieter cabin. 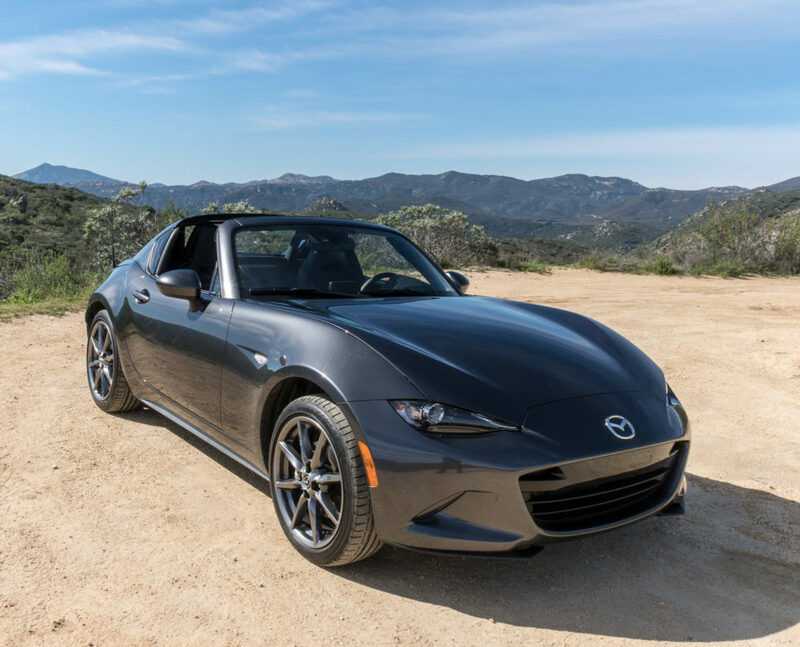 At first glance with the top up, the MX-5 RF looks like a Miata coupe, with an impressively seamless fit between its retractable hardtop and the rest of its body. In fact, I’ll go out on a limb and say that the MX-5 RF is the only sub-six-figure open-top car that looks equally as good with the roof up or down. 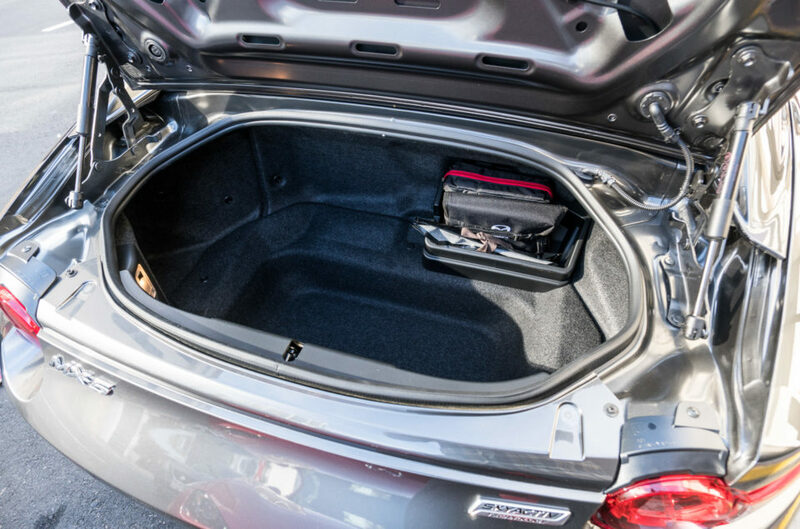 Mazda’s engineers worked all kinds of magic to squeeze in the electrically-retractable top, which fits neatly behind the passenger compartment when stowed, so there’s zero loss of trunk space – which is already at a premium in a car of this size. The roof is designed to retract in just 13 seconds with the push of a button, and can be operated any time you’re at 6 mph or lower. Mazda says that this speed was based on measuring how fast you could drive without someone with long hair getting their locks caught in the mechanism. Still, it’s speedy, and my driving partner and I had no problem putting the roof down while sitting at a red light. The aluminum, steel, and plastic roof and its mechanism add about 100 pounds to the weight of the svelte MX-5, but that minimal weight difference made no meaningful difference in ride dynamics from what I could tell. That said, Mazda retuned the suspension and steering to compensate for the added weight with the goal to ensure similar ride characteristics to the beloved roadster. Even with the roof, this car still weighs just 2,445 pounds – a rare feat these days. As much as I like the design of the MX-5 roadster, the RF stands out as even more visually appealing. It’s always hard to make a cloth roof look smooth and finished, and the hardtop and fastback style “B” pillars of the RF give the car a more cohesive and sleek roofline. 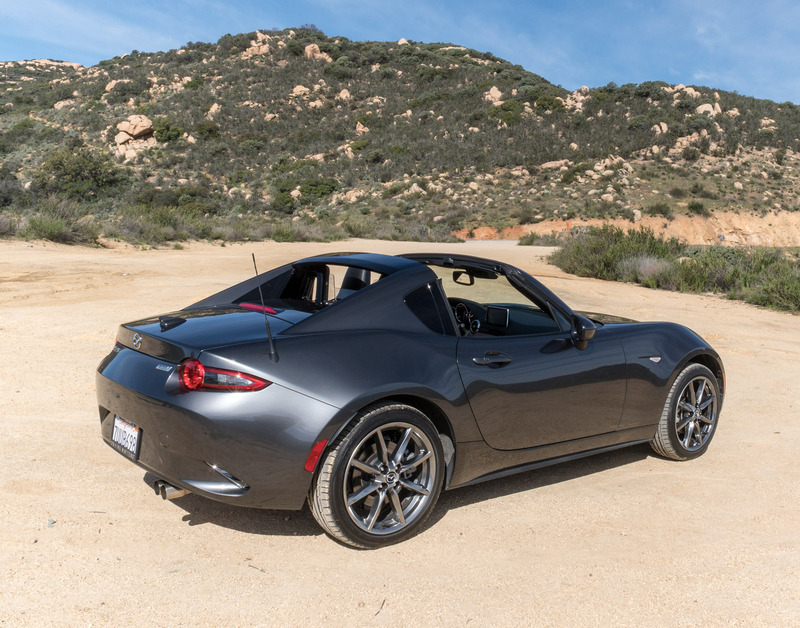 Other than the roof, the RF is virtually the same car as the MX-5 roadster, and that means it’s a blast to drive. Its 155 hp 2.0-liter Skyacrtv 4-cylinder engine offers enough get up and go for its size, and never feels short on power. 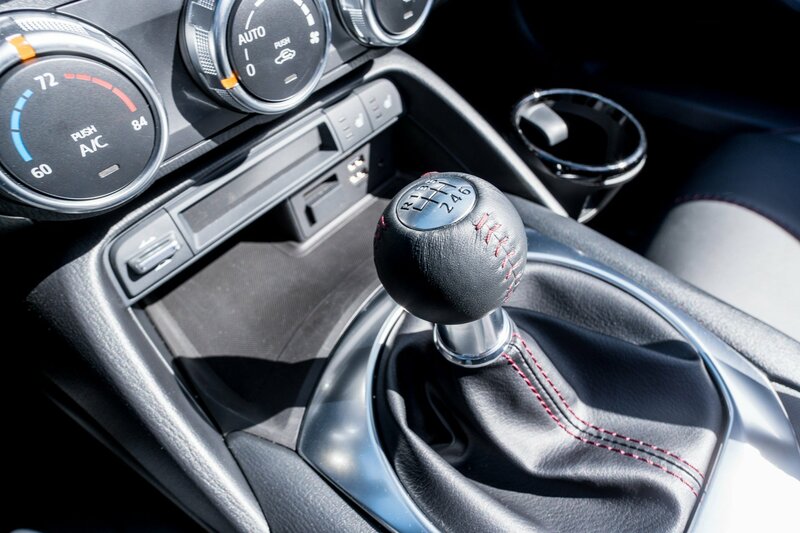 Acceleration is smooth and predictable, and the 6-speed manual gearbox and easy clutch is one of the best in the business, offering quick and satisfying shift action, and its clutch pedal is easygoing and quite forgiving. Fuel economy is excellent as well, with the manual offering up 26 mpg in the city and 33 mpg on the highway, and the automatic pushing the highway number to 35 mph. Like the roadster, the MX-5 RF handles like a go kart, with great cornering ability, along with just the right amount of body roll to keep things fun and dynamic around a bend. The steering isn’t too light or heavy, and provides good road feedback, while the suspension is sporty without being harsh. For those unfamiliar with a three-pedal setup, Mazda offers the MX-5 RF with a 6-speed automatic transmission as well, but I didn’t have the opportunity to test that setup. With the roof closed, exterior noise is much better controlled than in the cloth top, though I did notice just a little bit of wind noise coming from behind the cabin. That said, I was more than able to carry on a conversation with my driving partner at normal speaking volume. While I didn’t get a chance to test the car in extreme weather, I can only imagine that the hardtop provides better weather insulation than the cloth top too – and combined with the Grand Touring’s heated seats, it’s probably a pretty nice place to be even on a winter day. Mazda is offering the MX-5 RF in two configurations to start with – Club and Grand Touring. The main cosmetic differences between the two are cloth vs. leather seats. 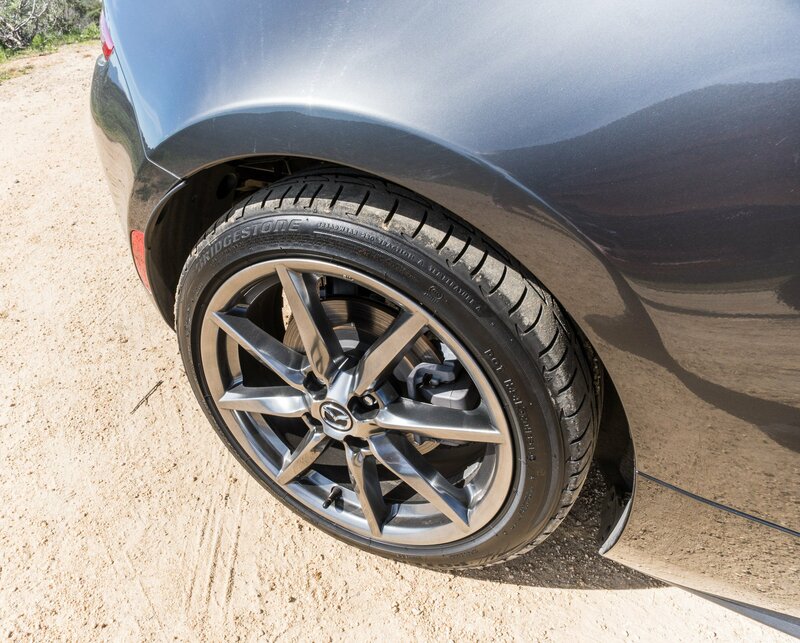 All variants come with 17″ dark-finished alloy wheels. The manual Club version comes with a limited-slip differential, Bilstein dampers, and additional shock tower bracing, and can also be kitted out with Brembo front brakes, BBS 17″ wheels, and an aero kit as well. The Grand Touring is more focused on ride comfort than sportiness, offering automatic climate control, heated seats, navigation, automatic headlights, and a few other bells and whistles. 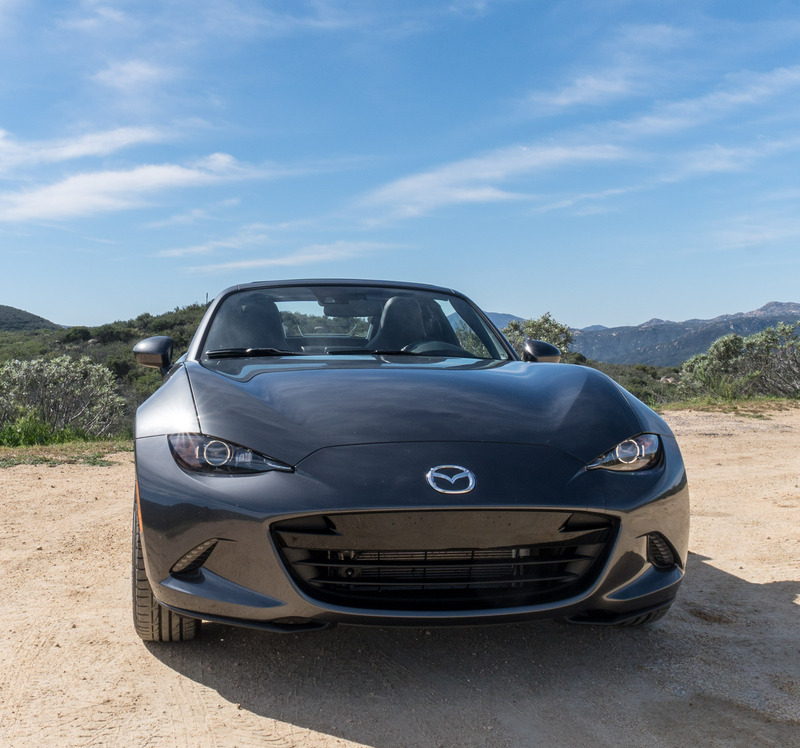 The MX-5 RF also comes in a great new paint color called Machine Grey, which is exclusive to the RF. Like the roadster, the interior is sporty and very much driver-focused. The analog gauges are large and easy to read, and the shift lever and parking brake are well placed for operation without bumping into cupholders or other stuff. One minor change from the roadster is that the 4.6″ information display is now color instead of black and white, but I spent exactly zero percent of my time looking at it anyhow. I had no problem with my seating position or comfort in the driver’s seat, but the passenger side is still a bit of a penalty box for those of us with long legs. 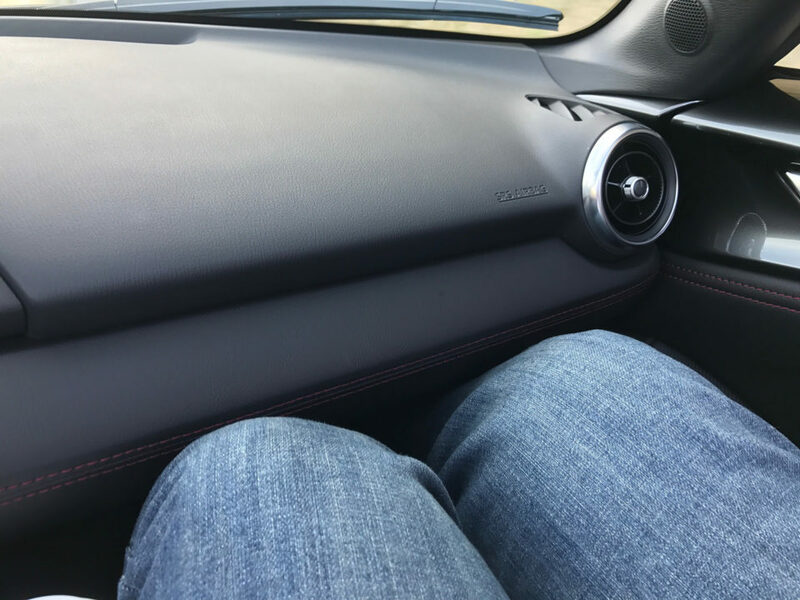 I’m 6-feet-tall, and found it impossible not to have my knees touch the dash padding. That said, I quickly forgot how cramped I was as my driving partner whizzed around the bendy roads along the California/Mexico border when it was her turn to drive. 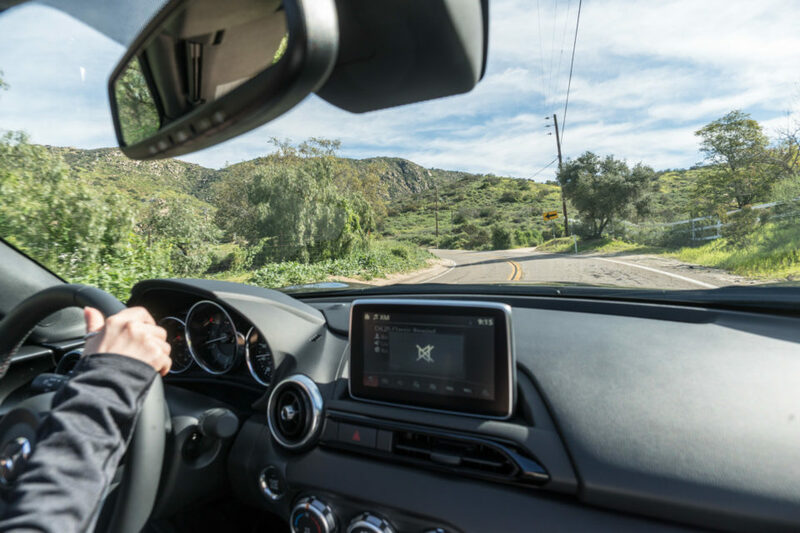 Mazda offers a number of convenience and safety features for the MX-5 RF, including blind-spot monitoring, rear cross-traffic alert, lane departure warning, high beam control, adaptive front lights, and rain sensing wipers, depending on the model you go with. The nine-speaker Bose audio system sounds good and comes with speakers built into the headrests to improve sound quality while driving with the top down. Mazda says that it expects that 60% of MX-5 sales going forward will come from the RF model, and I’m wondering if it might even be more this time out. 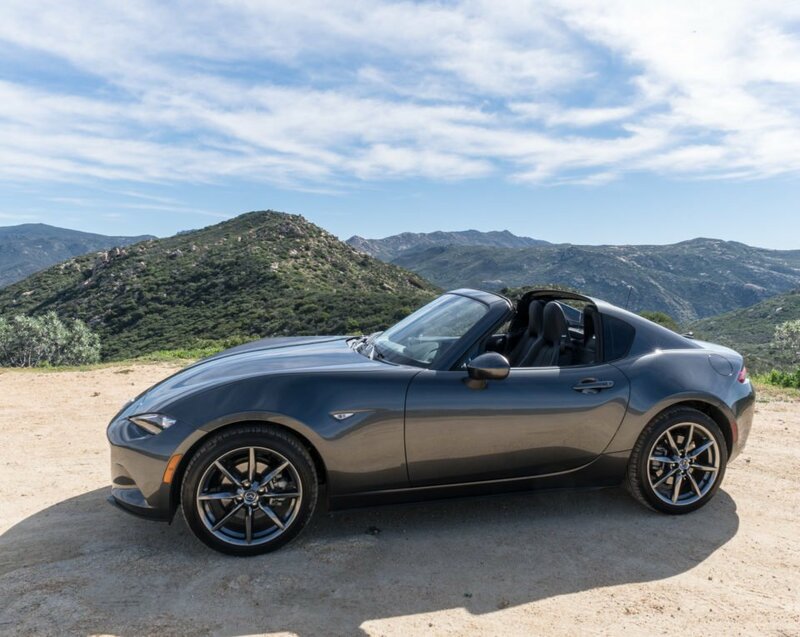 The MX-5 RF not only gets all of the great driving character of the current Miata, but it looks better, and gives you a better all-around environment on those days when you need to keep the top up. That said, it does start at $6,640 more than the roadster, with a base price of $31,555. 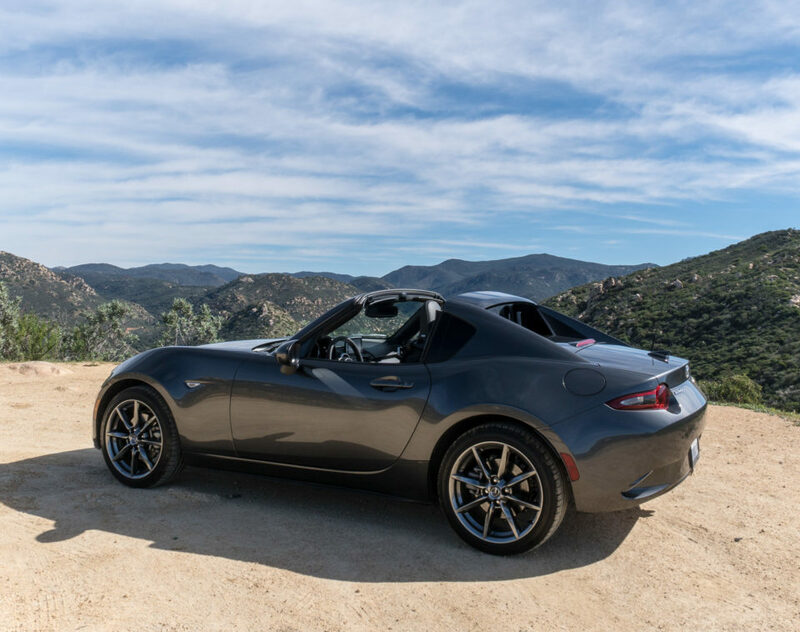 The 2017 Mazda MX-5 RF is a ton of fun to drive, and preserves everything that makes the ND roadster so great. 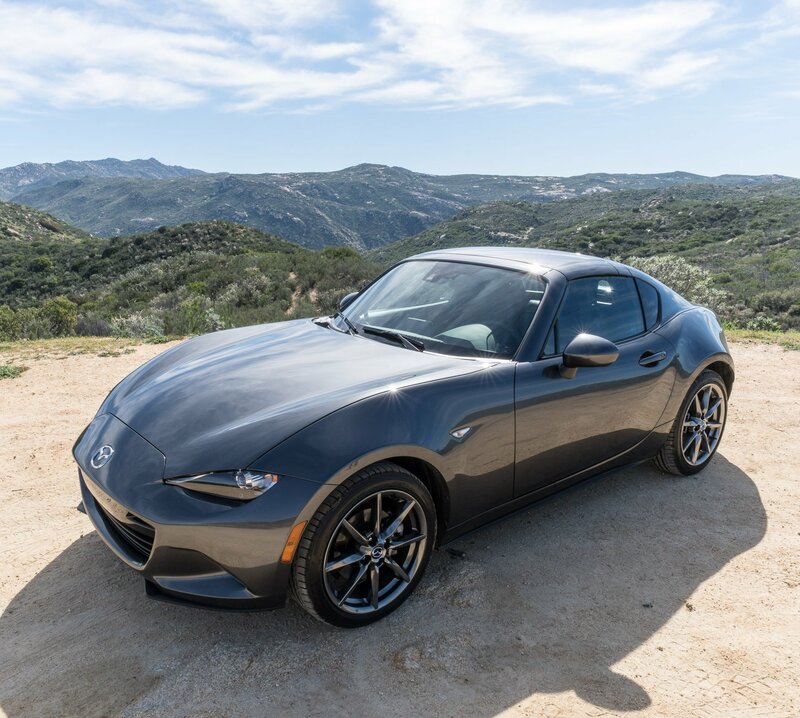 I can think of few other cars that can offer as many thrills for the price, and with the slick new retractable hardtop, Mazda has another great car to add to their already solid line.